LOVE & PEACE & DOLPHINS! Hi friends! I drew this Zentangle”esque” picture to commemorate a super special day I had this summer. My dear sister was in town we had not seen each other in a year. We went to the boardwalk for a stroll and when we were done we sat on a bench and looked out to the ocean. I grew up going to this beach and spent many a summer day looking out on this sea. I had NEVER seen a dolphin here before. On this special day, a day that was filled with much love and laughter (and let me tell you when the two of us start laughing you can hear us for miles!!) we saw a pod of dolphins frolicking in the sun…and we knew we were blessed! I decided to include another photo of the drawing. I almost think I liked it better at this stage. As in life, I sometimes go overboard 😉 I’m happy I took photos at various stages because I was able to capture it before my pens went to town. Lorrie, there are such beautiful drawings and haiku to commemorate your time with your sister! Had a passing thought of you, and within minutes bumped into this eloquent work! Happy to run into your presence in your art today! It deserves being shown!!! Blessings to you also. I adore this image, you have so much talent and it makes me smile to see the happiness of the dolphins, kudos!!! Thanks Lorrie. I’m grateful for our connection too and your boundless joy. 🙂 Your post reminded me of the few times I’ve been near dolphins and the excitement I felt. Thank you so much, Kim! There was a time I was afraid to ‘show’ myself but I think I have that conquered!! 🙂 I appreciate you so very much. And thanks for the kudos on the art…I have always admired how you share your art so willingly. Much love for a super weekend! Woohoo! Another creative endeavour by the lovely Lorrie. It’s great, my friend. And what a great experience to get to witness a sight as such with someone you love and haven’t seen for a year. I’m sure you’ll remember that day for a long time. Hope you are doing well otherwise Lorrie. Please have an amazing and creative weekend. Hi Lorrie, you’re more than welcome. I’m sure it is fun. Thanks for mentioning the book. It’s coming along, although I won’t have it done by the time I travel to Canada, like I had planned/hoped. It’s all good though. I’ve decided to take my time and try my best at it instead of rushing. You also have a blessed rest of the week. Oh yes, that’s right. I’m sure you’re probably in the think of it right now. I’ve seen it on the news, and all the disaster it’s caused in Haiti. I hope and pray that all is well with you and all of Florida Lorrie. Please do give an update to let us know that all is ok once things simmer down a bit. Thanks dear Staci!! We were so lucky the storm took a tiny turn to the east before it got to us which made all the difference in the world! We we spared the eye of the cat 4 hurricane making landfall on us. We had to evacuate but are home now and all we had was downed trees and debri…so BLESSED! I am heartbroken over the lives lost in Haiti and as I woke this morning I see how Matthew is wreaking havoc all up the east coast. Thank you for your thoughts and love…this storm was frightening…mother nature releasing power of incredible strength!! Oh that’s great news Lorrie. Good thing for you guys. Haiti, on the other hand, has really had it bad, to say the least. I have a friend that just got back from there. She was with a mission’s team, helping to build a school. At any rate, I hope things are getting back to normal. Please have a wonderful week Lorrie. 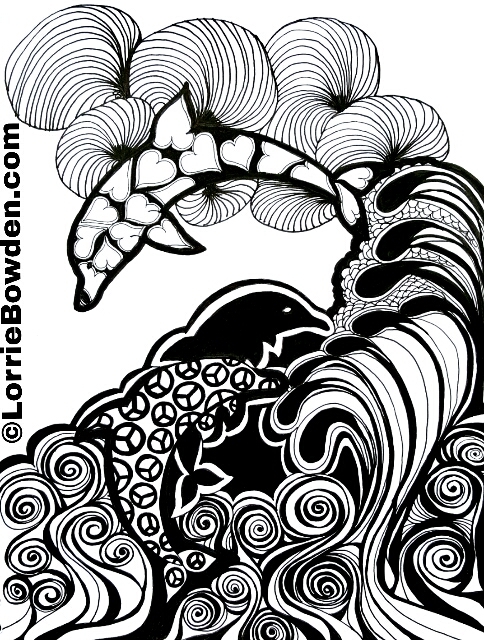 I believe the dolphins were drawn to the love and laughter coming from Lorrie and her sister. Congratulations. That’s no easy feat. I’m heading into my 5th year and still have not posted that many. Be proud of yourself for that accomplishment. Your zen-tangle is amazing! I think the dolphins heard you laughing and wanted to join the party. Everyone and everything is drawn to the sound of laughter. It’s so good for the soul. Have a wonderfilled weekend. Wonderful, and as you express it, I can connect to it, whereas I may have not otherwise, my brain could have latched onto something else, but my mind is quite happy in this moment and in that thought. Thank you 🙂 so much!! A beautiful post, Lorrie, and congratulations on your 300th post! Your art is stunning. I always enjoy reading your posts, Lorrie. I’m sorry for the absence lately – I’ve been needed elsewhere. It’s good to be back. Wishing you a beautiful week. Beautiful drawing and poems. What a wonderful thing to commemorate a special event in this way! 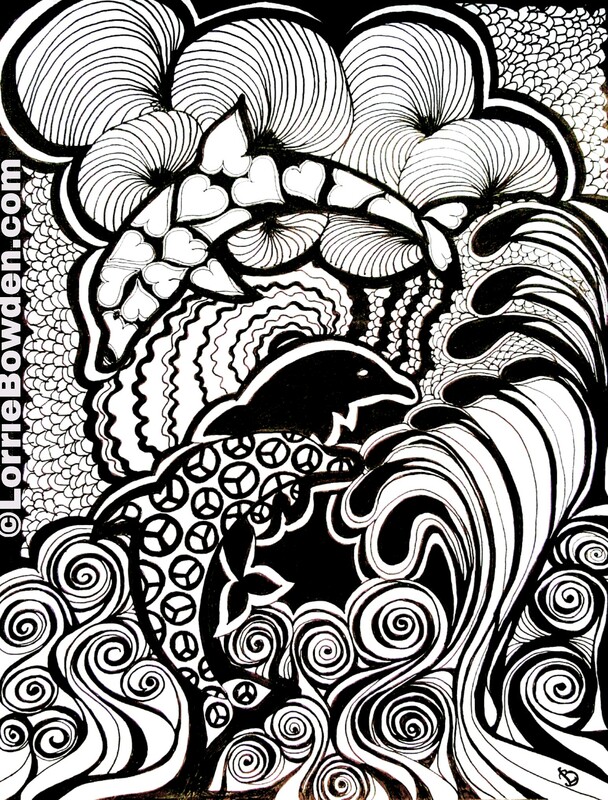 What an exceptional day you had with your sister Lorrie and then to cap it all off your wonderful views of the Dolphins who had come to add their blessings to your day..
And I so love your creativity in your fabulous drawing.. Wonderful artwork dear Lorrie..
And congratulations upon your 300th post my friend.. I loved your poem and dedication to you sister.. Thank you dear Lorrie.. I am well, very well thank you and have just returned from a vacation in Scotland, so catching up with my comments and blogs today..
LOVE, LOVE. LOVE this article! Thank you so much for sharing!! Thank you so much! I’m happy you enjoyed it…and welcome! Hope you always feel at home here!